Greetings from the frozen Great White North....which, in actuality, isn't all that frozen, or all that white. For winter in Canada, I'm finding it quite mild and tolerable. I like that! Yesterday, in the late afternoon, I was driving from Toronto, heading east to my hometown, Kingston on the 401. I noticed that a lot of buildings, especially the very large, warehouse buildings/big box stores, gas stations, etc. were flying their large Canadian flags at half-staff. I figured that perhaps some Canadian politician or someone very well-known person had died and I hadn't heard about it on the US news. Then, I approached a bridge that goes over the 401 and there were a couple of firetrucks parked on it. A few miles further down the highway and I saw another bridge with people gathering. That's when it occured to me: another Canadian serviceman would be travelling the "Highway of Heroes", a portion of this busy highway that had been renamed. I'd heard about this occurence before and now I was going to experience it, and it was very touching and so sad. 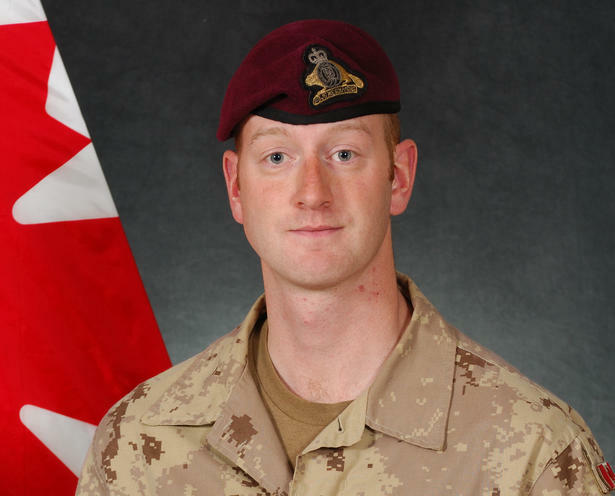 When a Canadian serviceman or woman, dies in Afghanistan they are flown back to the air base in Trenton, Ontario. 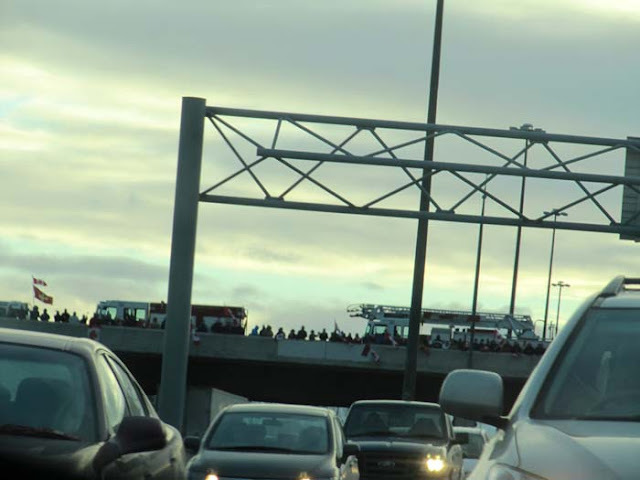 From there they are taken by hearse, escorted by police cars, on Highway 401 from Trenton to the Don Valley Parkway in Toronto, where they will then head to a medical facility to be autopsied before they go home to their family and their final resting place. It's a spontaneous guard of honor that has happened along the route, started a few years ago. People learn of the time when the procession will be passing by their area and they gather on the bridge. This includes the fire department, police and ordinary Canadians. 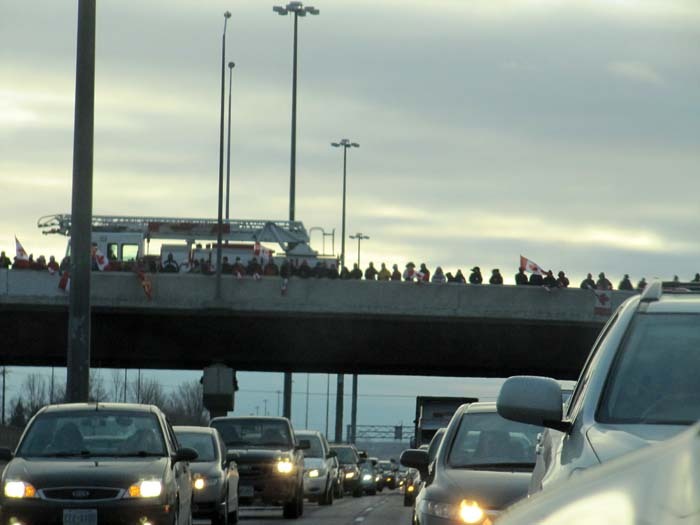 When the hearse approaches the bridge, they wave flags, some stand at attention, some salute. It's amazing to know about this way of honoring a fallen hero, but by seeing it, I was also feeling it. Very quickly I grabbed my camera and snapped these pictures through my sideview mirror as I drove away from the bridge. Just a minute later, in a lane in the other direction, came the sad procession, driving very quickly. All the rest of the traffic, in both directions, was repectful and stopped. The young man died on December 19th. His name is Cpl. Steve Martin of the 3rd battalion, Royal 22nd Regiment, Valcartier, Quebec. He was killed by a roadside bomb while on foot patrol in the Panjwaii district west of Kandahar City. He died two days before his 25th birthday. A touching way to honor the fallen. May he rest in peace as a hero.